Want to know the time in Leura? With Wenty and Katoomba both boasting public clocks that keep pretty accurate time, why is Leura bereft? A new electronic magazine – the Whistler – based in the Blue Mountains, launches with an investigation of just why the clock on the Spires has never worked. Other stories are of local interest too. 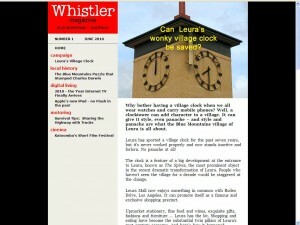 Katoomba Leura Online supports the Whistler in its quest to get the Spires clock working. This entry was posted on Tuesday, June 29th, 2010 at 9:46 am	and is filed under Mountains Life, Reviews/Recommendations. You can follow any responses to this entry through the RSS 2.0 feed. You can skip to the end and leave a response. Pinging is currently not allowed.